We want your lease-end transition to be as smooth as possible. Online resources can be a great help when you're looking for a quick answer. That's why we've provided a few of them here. The Wear Tool is a vehicle self-inspection tool that can be used to determine areas of excess wear. 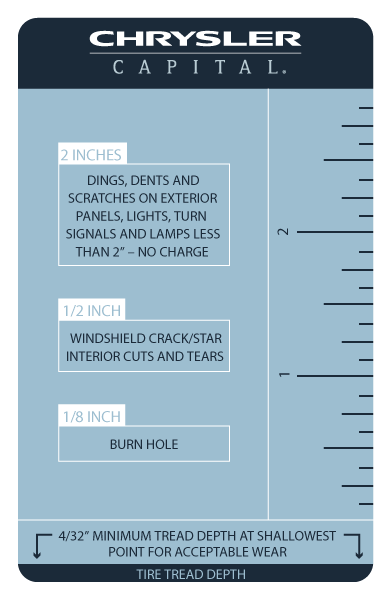 The sizes outlined on The Wear Tool are representative of normal wear and use dimensions. Although we recommend that you use this reference to help in eliminating potential surprises, you will still need to schedule an inspection prior to your turning in your vehicle. Ideally, your vehicle will have no excess wear and use, however, if repairs are needed, we recommend you visit your originating dealership. Repairs should be completed prior to your turn-in date to avoid additional charges. BY THE WAY...some repairs may be covered under warranty or insurance, which can result in significant savings for you!